Toowoomba is Queensland’s largest inland city, and Australia’s second largest behind Canberra. Defying a nationwide trend in rural areas, Toowoomba continues to grow and flourish. Pack a picnic or the makings for a delicious barbecue and head for Picnic Point Lookout. This 160 acre park offers magnificent views of the Main Range and Lockyer Valley. Catch a show or simply take an historical tour of Australia’s largest regional performing arts complex. This heritage listed art deco building opened on 27 November 1933, and was the cultural hub of Toowoomba until it closed in 1971. Unused, the building started falling into disrepair until undergoing extensive restoration and reopening in 1997. Rediscover Australia’s transport history at the Cobb & Co Museum. The museum has an impressive number of interactive displays and exhibits. You can even learn new skills by taking part in a heritage trade workshop on blacksmithing or leadlighting. Grab your mountain bike and head to Jubilee Park. The park is home to several bike tracks, all developed and maintained by the Toowoomba Mountain Bike Club. Nearly everyone you ask will tell you early spring is the best time to visit Toowoomba. And for good reason, there are flowers blooming everywhere in this beautiful city. However, there are other great times to visit. A visit in autumn lets you see the beautiful changing colours of the trees. The weather is cooler, but not cold enough to keep you inside. The skies are blue and the chance of rain at this time of the year is at its lowest. Toowoomba’s subtropical climate leads to warm summers and cool winters. The average maximum summer temperature is 28 ℃ and a cool but comfortable 17 ℃ during winter. Due to its location on top of the Great Dividing Range, rainfall is higher than many other Darling Downs locations. The majority of the rainfall occurs between November and March. This period is also known to produce severe thunderstorms, so care should always be taken. The original settlement of Drayton commenced in the early to mid 1840s. A marshland located 6 km north east of the settlement was identified as a way to effectively manage the common dry spells. In 1849, the land around the ‘swamp’ was surveyed and plans were drawn for 12-20 acre farms in the hopes of attracting more people. The swamp was later drained and became the foundation for what is now Toowoomba. The name Toowoomba was first used on an official document in 1852, at the christening of two children in the Alford home. While there are several theories on how the name came to be, there is no general agreement. Most agree it is taken from a local Aboriginal word, some records point to ‘Tawampa’ meaning swamp, some state ‘Woomba Woomba’ the term for reeds in the swamp, while others believe it comes from the name given to a melon in the area, ‘Toowoom’. 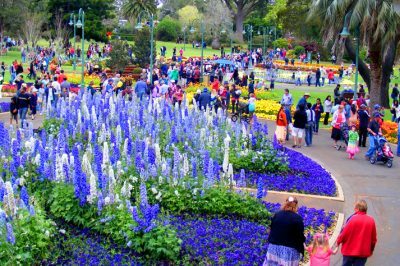 Toowoomba is home to over 150 of the most beautiful parks and gardens in the country. There is the Newtown Park State Rose Garden where you will lose yourself in the scent of over 1,500 roses. Delight in the tranquility of the traditionally designed Ju Raku En Japanese Garden. Or join in one of the many events and festivals in the meticulously maintained gardens of Queens Park.